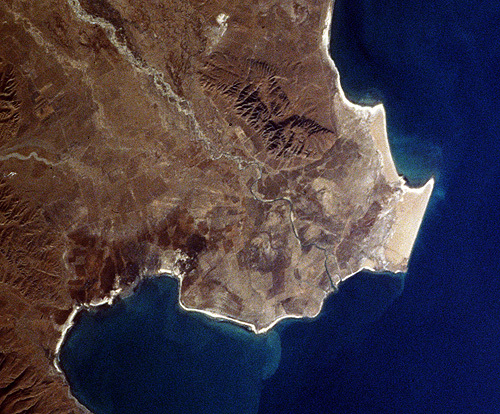 Bird Island is located near the mouth of the Buh He, one of the rivers feeding Qinghai Lake. The image at right is a blowup of a portion of the Space Shuttle picture shown above. One can easily see the sandy area of the Bird Island sanctuary, which is now connected to the mainland, stranded by retreating waters of the lake. The water from the Buh He is largely consumed by irrigation, and little reaches Koko Nor. 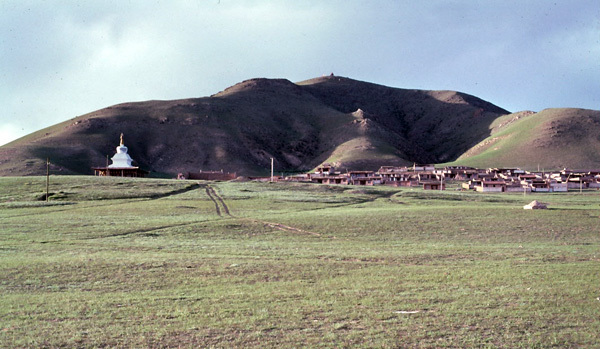 A Tibetan village and Shantao Monastery are located near the Chinese settlement of Bird Island. Near the monastery is a chörten, its square base surrounded by racks of shiny brass prayer wheels (left). A chörten is a structure housing relics of a holy man, either his remains or some of his belongings. The component parts of the chörten represent multiple aspects of the Buddhist religion, first of which is the physical presence of the Buddha. At this level, the base represents his throne; the four steps below the dome are his legs crossed in lotus position; the dome is his torso; the square represents his head; and the spire is his crown. The square may have eyes painted upon it. The structure may also be interpreted at a deep philosophical level. For example, the lower ten gilded disks of the spire symbolize the ten powers of the Buddha, and upper three disks stand for the three close contemplations or mindfulnesses. One can imagine the series of disks as steps towards nirvana. On a simpler level, the parts of the stupa embrace the five elements: earth (base), water (dome), fire (spire), wind (moon), space or sky (sun). More on stupas and their symbolism may be found at http://www.stupa.org.nz/stupa/info.htm. I turn some of the brass prayer wheels, which are at chest-level in wooden frames, oblivious to the complex symbolism of the chörten rising above me. 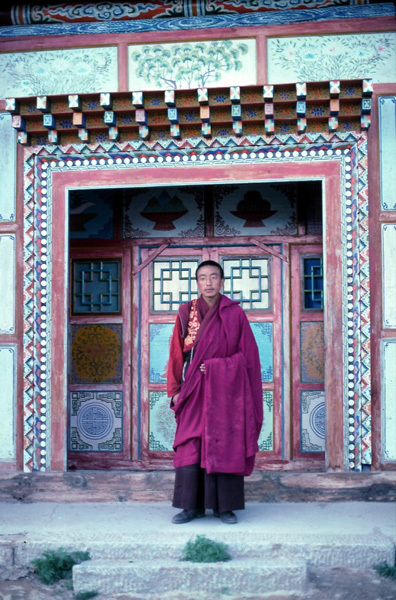 At the monastery, we encounter a young monk who allows us to photograph him before a beautifully carved and painted doorway (right). The blare of a horn and deep chanting issue from a walled courtyard nearby, and he leads us through a rough wooden door. The courtyard is flagstoned; a wind-driven prayer wheel, which is mounted on the wall, spins rapidly, sending blessings over the countryside. The entrance to the temple is protected by a curtain. The chanting comes from within. When they are finished, the monks join us in the yard. It is getting dark and sadly, we must depart.